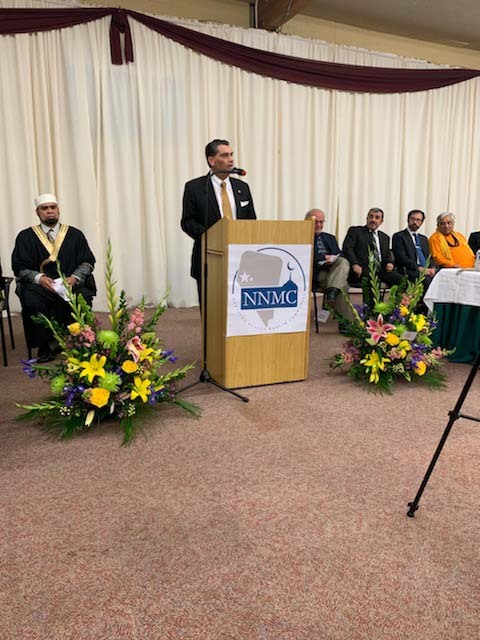 In light of the horrific events that took the lives of 50 Muslims in two mosques in Christchurch, the Northern Nevada Muslim Center hosted an event to remember them and to show solidarity. 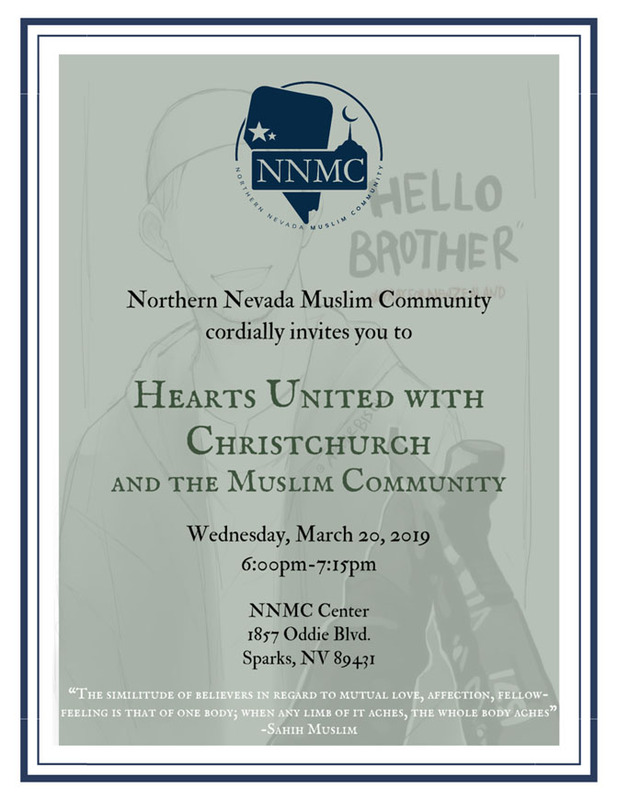 The event, called “Hearts United with Christchurch and the Muslim Community,” was held Wednesday, March 29, 2019 at the center on Oddie Blvd in Sparks. On behalf of the International Community of Christ, let me express my sincere condolences to all of my Muslim brothers and sisters. I am very honored to be here at this service of prayer, solidarity and coming together in the face of violence against people of faith and in the name of religion. But I am also very sad. I’m upset. I am sad, of course, about why we are gathered here today. But I am even sadder at what I see happening in our world today. It seems that no place on earth, save Antarctica, is safe any longer from this creed of hate which has achieved a new life on social media. Muslims were attacked and killed last week in New Zealand. Four days before that, 52 Christians were attacked and killed in Nigeria and 153 of Christian homes burned to the ground. Last October, Jews were attacked and killed in Pittsburgh. And it goes on and on. We should all be outraged. Let me say that again: we should all be outraged! Because the key to understanding today’s terrorist threats are not merely to be found in the online underground, which has become a breeding ground for contemporary extremists of all kinds, but to understand the profound and blatant evil and darkness manifesting in today’s world in great magnitude. Let’s make no mistake about it: What we are witnessing the world over is evil and Darkness. Is this the world in which we want to live? Is this the kind of place we want to bequeath to our children? It will be, as long as we turn a blind eye to the vast amount of pain and suffering that goes on in the world around us. We can no longer choose to remain silent or be oblivious to this profound evil and darkness that is permeating the world. And that is what this is. Let’s make no mistake about it. This simply is profound evil and darkness. And it is now targeting people as they go into their places of worship – their sacred and quiet places. There will be no place for refuge any longer if we continue along this path. What is next? Our homes? But, we come together to offer hope. We come together to say that we will not be driven from our places of worship – none of us. Let us be reminded that the spirit is strong in the human race and sometimes we, each and every one of us, needs to be reminded of the immense power we have to do good or to do evil. If the peoples of the earth were to realize this, they would turn from the ways of ignorance and submission to evil and darkness and embrace the good and the light with all of their might. And that, perhaps, is what we are here to do: to encourage people to break from the hold of evil and darkness. If we see it, don’t turn a blind eye. If you hear it, don’t be silent. Life is too precious and time is too short for the human family to play this deadly game of unending strife, war, instability, and hate. The peoples of the earth cry out for peace. But peace begins with the individual who lives god’s way. When we collect together in peace, of whatever religion or spiritual community, we then become people of peace and fellowship with one another. My heart, my thoughts, and my prayers go out to everyone who has suffered from this evil and darkness. Thank you for having me.